Data Scientist at Apple, researcher at Precog@IIITD, and a former PhD student at IIIT-Delhi. Advised by Dr. Ponnurangam Kumaraguru ("PK"). My areas of interest are social media analytics, cyber crime, privacy and security in online social media, machine learning, deep learning, natural language processing, and data mining. I completed my Ph. D. in Computer Science in November, 2017 from IIIT-Delhi. Prior to Ph. 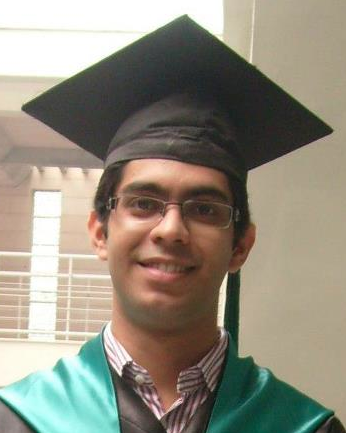 D., I completed my Masters degree in Computer Science (specialization in Information Security) in 2012 from IIIT-Delhi. I got by Bachelors degree in Computer Science and Engineering in 2010 from Rajasthan Technical University, a state university in India. Geeky, enthusiast, opportunist, optimistic, and a die-hard Lamborghini fan. Ph. D. in Computer Science. Worked on adversarial machine learning and generative deep learning models as part of the Open Science Collaboration Program (OSCP) between IBM and IIIT-Delhi. The goal of this project was to investigate the robustness of generative adversarial networks (GANs) against adversarial feedback. Worked on a project on analyzing spear phishing emails using a combination of stylometric and social features. Worked on developing ZoRRo, a system and method for preventing information leakage from text documents. We exploited access control policies from databases to identify and redact sensitive information from text documents. Worked on building a web ontology for violent online political extremism and radicalization as part of VOX Pol. Kaushal, R., Chandok, S., Jain P., Dewan, P., Gupta, N., and Kumaraguru, P.
Nudging Nemo: Helping Users Control Linkability across Social Networks. 9th International Conference on Social Informatics (SocInfo), 2017 (Short paper). Dewan, P., Bagroy, S., and Kumaraguru, P.
Hiding in Plain Sight: The Anatomy of Malicious Pages on Facebook. Dewan, P., Suri, A., Bharadhwaj, V., Mithal, A., and Kumaraguru, P.
Towards Understanding Crisis Events On Online Social Networks Through Pictures. IEEE/ACM International Conference on Advances in Social Networks Analysis and Mining (ASONAM), 2017. Dewan, P., and Kumaraguru, P.
Facebook Inspector (FbI): Towards Automatic Real Time Detection of Malicious Content on Facebook. Social Network Analysis and Mining Journal (SNAM), 2017. Volume 7, Issue 1. Hiding in Plain Sight: Characterizing and Detecting Malicious Facebook Pages. Towards Automatic Real Time Identification of Malicious Posts on Facebook. Deshpande, P., Joshi, S., Dewan, P., Murthy, K., Mohania, M., Agrawal, S.
The Mask of ZoRRo: preventing information leakage from documents. Dewan, P., Kashyap, A., and Kumaraguru, P.
Analyzing Social and Stylometric Features to Identify Spear phishing Emails. Mittal, S., Gupta, N., Dewan, P., Kumaraguru, P.
Pinned it! A large scale study of the Pinterest network. Dewan, P., Gupta, M., Goyal, K., and Kumaraguru, P.
Magalhães, T., Dewan, P., Kumaraguru, P., Melo-Minardi, R., and Almeida, V.
uTrack: Track Yourself! Monitoring Information on Online Social Media. Conway M., Dewan P., Kumaraguru P., McInerney L.
Internet, Politics, Policy 2012: Big Data, Big Challenges?, Oxford Internet Institute, University of Oxford. The Anatomy of Malicious Facebook Pages. Facebook. Because studying events and spammers on Twitter is too mainstream. Dewan, P., Sachdeva, N., Gupta, M., and Kumaraguru, P.
ChaMAILeon: Usable email sharing like never before! A Survey on Identification and Analysis of Poor Quality Content on Facebook. It Doesn't Break Just on Twitter. Characterizing Facebook content During Real World Events. Mittal, S., Gupta, N., Dewan, P., and Kumaraguru, P.
The Pin-Bang Theory: Discovering the Pinterest World. 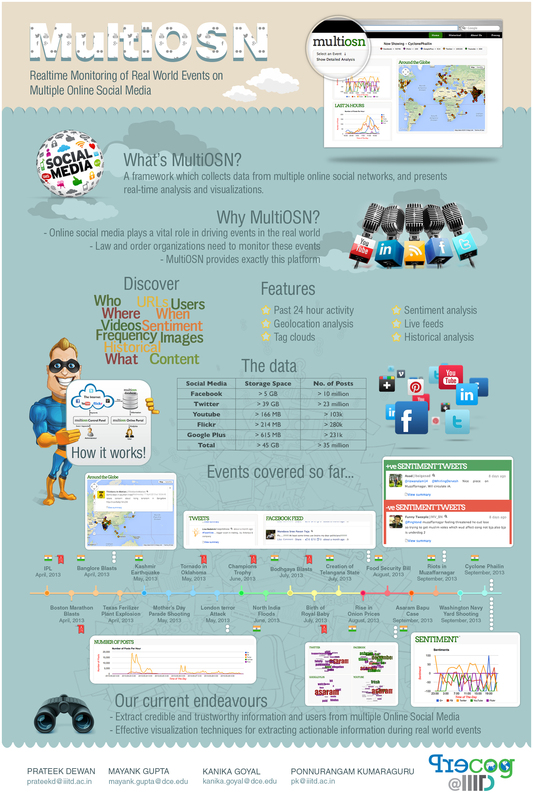 MultiOSN: Monitoring Multiple Online Social Networks During Real-World Events. Dewan, P., Sachdeva, N., Kumaraguru, P.
Dewan, P., Gupta, M., and Kumaraguru, P.
ChaMAILeon: Simplified Email Sharing Like Never Before. Technical report "Visual Themes and Sentiment on Social Networks to Aid First Responders During Crisis Events" featured in The Best of arXiv, by MIT Technology Review. Best poster award, Security and Privacy Symposium, IIIT Delhi, 2016. Best student award, Security and Privacy Symposium, IIT Kanpur, 2014. Awarded the NIXI Travel fellowship from National Internet Exchange of India (NIXI) for 2014. Program Committee member, Youth Internet Governance Forum (Youth IGF), 2014. Facebook Inspector (FbI): Browser plug-in for automatic real-time detection of malicious Facebook posts. ChaMAILeon: Simplified Email Sharing Like Never Before!